Biloxi Fishing Charter - Choosing the right equipment. We’re all familiar with these descriptions and phrases but they just don’t apply to the Fishing Rod. For years I’ve taken the “adjustable wrench” approach with my go to fishing rod and tried my best to make it work. As bad as I would love to have the all-around perfect fishing rod, it just isn’t happening. I try my best to be an all-around Angler. On any given day you might find me wade fishing the beach, kayaking deep in the bayou or on the bay with one of my fishing buddies. To be successful it takes the right equipment. I suppose fishing is a lot like golf. You wouldn’t use a driver to make a chip shot and you wouldn’t use a snapper rod to sight fish reds against the grass line. Like golf where you have different club lengths and face angles, fishing rods come in various weights, lengths, actions, and lure and line weight configurations. They all have special purposes and are designed to give you the best feel for a set of baits. To dial it down even closer, it’s hard to find just one rod that will cast both a popping cork rig and an eighth ounce jig. Generally speaking with a popping cork I’m casting on a flat not looking for pinpoint accuracy and making long sweeping pulls. However, with the jig I’m sticking it in a pocket or casting to a point. I want to feel every oyster and I especially want to feel the subtle pick up or bump. In fact, with the right rod you can even feel the vibration caused by the paddle tail of a soft plastic bait on a steady retrieve. Sure, you can use a one size fits all approach, but you will miss more fish than matching the rod to the application. On a typical trip to the bay I’ll take at least four different set-ups. I usually start off throwing a top water lure, then I switch to a MirrOlure. Depending on the bite I’ll move to a jig or a popping cork. 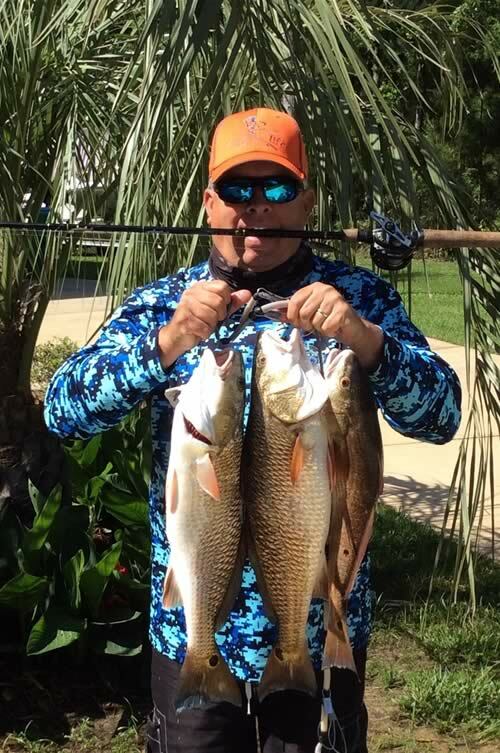 When I’m in my Kayak down the bayou, I’ll only take two combos because I’m pretty much fishing the same methods all day. Wade fishing I travel light with only one rod. In that case, my truck or boat is always near and I can get a backup if I need to. There are plenty of good off the rack rods and you can actually find just about anything you want if you’re willing to look for it. The color might not be right or the grip may be a little loose. Remember I’m talking fishing rods. This is you’re connection between a gamefish fighting for its life and your primal instinct as fisherman. It’s the tool you have in your hand four hours straight that one Saturday a month when the weather is not on your side. Let’s face it, to be successful when all the odds are against you, you need an edge. At the end of the day a good rod can make it happen. For that “just right” feel, you can’t beat a custom rod designed to your Specs that is spined correctly to the action of the rod blank (more explanation on this in the future) I know what you’re thinking, Big Bucks-High Dollar. Not really. If you buy a good quality rod like a Falcon, G Loomis, or Castaway, chances are you’re spending a couple hundred dollars. With a budget like that, a Rodsmith can turn out a real nice custom rod built exactly how you want it. I’m not saying you need to go out and buy a dozen Combos to catch a few fish. That ole faithful spinning outfit will do just fine, but if you want to improve as an angler and have greater success, match your rod to the application and you will feel more fish.